Cologne - Three games, three wins, nine points; one club still has a 100 per cent record in the Bundesliga in 2015: and, to the surprise of many, that club is Werder Bremen. A 2-0 victory over Hertha Berlin in the first match after the winter break and back-to-back 2-1 successes at 1899 Hoffenheim and against Bayer 04 Leverkusen have propelled Bremen from third-bottom of the table up to eighth since the resumption of league action. Indeed, rewinding just one further matchday, it was only an end-of-year win against Borussia Dortmund that spared the Green-Whites the ignominy of spending the winter break propping up the division altogether. In truth, the team's current form is no turnaround sensation but rather the ongoing dividend accruing from an impressively swift process of revitalisation under Viktor Skripnik. The victory over UEFA Champions League contenders Leverkusen took the former Ukraine international's balance as head coach up to seven wins in eleven Bundesliga outings. 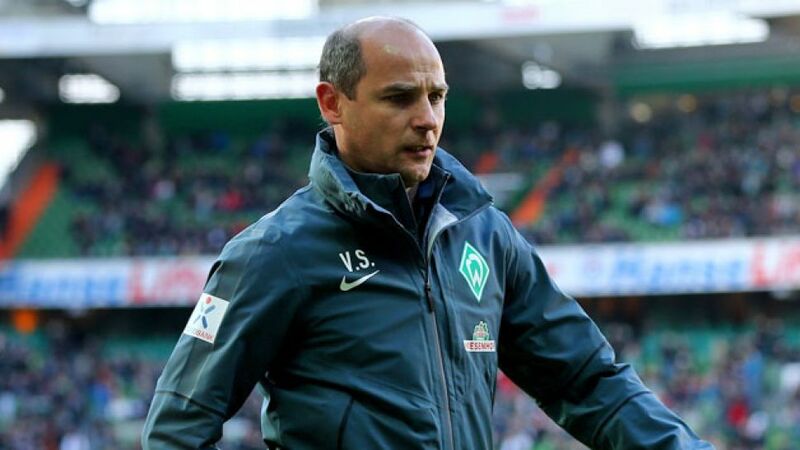 It has certainly been an incredible turnaround; when he was bumped up from reserve team coach to the main job, as Robin Dutt's successor, in late October, Werder were bottom of the table and still seeking their first win of the season. Now, far from struggling against relegation, the club look to be heading full-throttle towards the battle for places on the European stage. As far as that goes, Skripnik, while acknowledging “our situation in the table's looking pretty good,” remains resolute that for the time being, “we're still watching what's happening below us, rather than above.” If his charges continue in their current vein, however, it will surely soon be time for an upward adjustment. In downing Leverkusen, Bremen moved to within six points of the ambitious Werkself, who themselves dropped to sixth as a result. On home turf in particular, the north coast outfit are a force to be reckoned with once again - since Skripnik took charge, assisted by another Werder veteran in the form of iconic former skipper Torsten Frings, they have taken 16 of a possible 18 points at the Weserstadion. The latest success was also achieved without injured nine-goal top scorer , underscoring the team's newfound self-belief and spirit in the face of such individual setbacks. Two goals inside the opening half-hour proved decisive against Bayer. Playmaker drilled home a trademark free-kick for what would be the eventual winner and prior to that, , rapidly developing into one of the finds of the campaign, got the ball rolling in the 17th minute. The rangy striker, who only turned 20 in January, has featured in 17 of Werder's league matches this season, starting 11, and now has five goals and three assists to show for it. Selke incidentally scored his first league goal at FC Augsburg on Matchday 4, with just three minutes on the clock at that. It counted for nothing in the end as the hosts ran out 4-2 winners. Now, Werder have the opportunity to make amends for that defeat at their re-buttressed Weserstadion stronghold this Saturday. That will be easier said than done, though, against an Augsburg side who themselves have won seven of their last ten games and were only denied a share of Bremen's 100 percent record for the year - and third place in the table - when Eintracht Frankfurt battled back from 2-0 down to salvage a draw last Sunday. Unlikely as it would have seemed not so long ago, Werder Bremen against FC Augsburg has thus emerged as one of the meatiest encounters of the upcoming matchday. The putative relegation battlers against the provincial minnows, both still outwardly coy about their season targets, but both looking increasingly like candidates for a place on the European stage next season. For Augsburg, it would be a first - for Bremen, a long-overdue return to the norm.